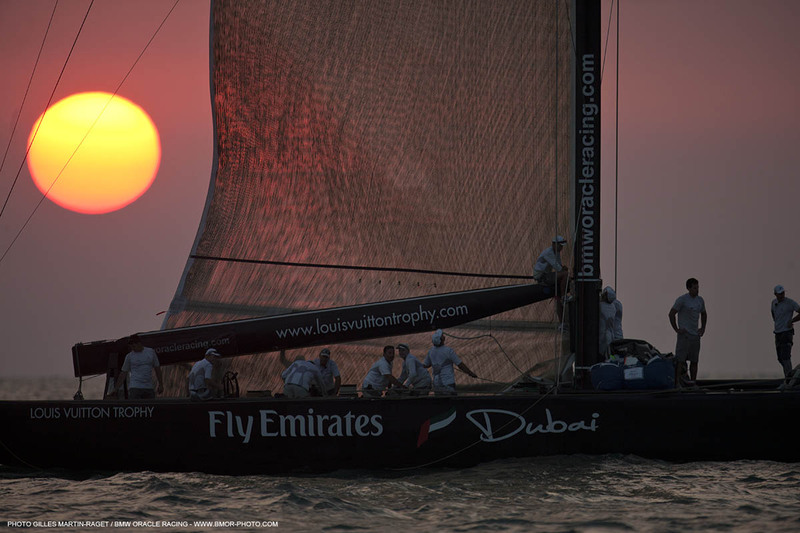 BMW ORACLE Racing opened its account of the Louis Vuitton Tophy Dubai with a pair of victories over All4One, the combained German/Fresnch team. After racing mastman Shannon Falcone shared his thoughts on the day’s racing. Talk about your day on the water. We had a great start to the regatta. It took a while to get out on the water because of the light winds in the morning. But by the time we got racing we had a good 12 knots. It was really good, close racing. I didn’t think we could do so many tacks on a short course; I don’t think we ever got up to speed. But it’s good to have that kind of action for the spectators and us. 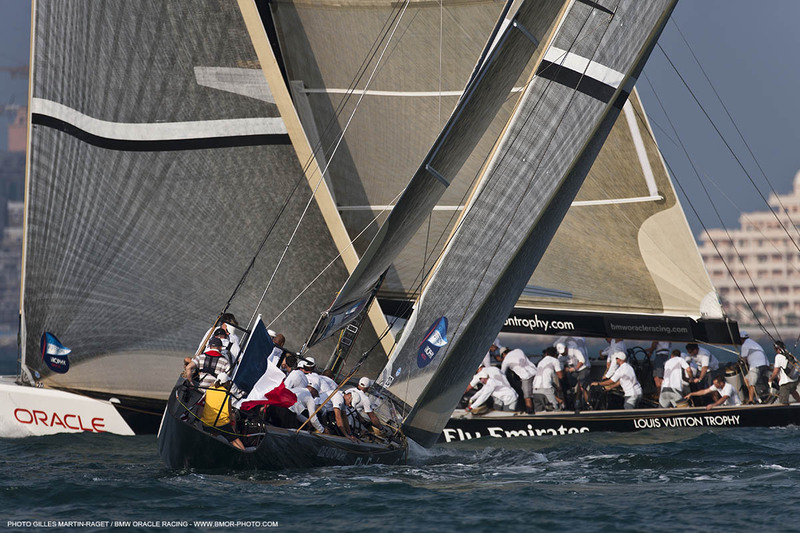 You’re the mastman which means a lot of work at mark roundings, but what do you do on the upwind legs? Upwind I’m on the main pedestal with Joe (Spooner). We’re clicking between the jib and main. It was full-on. You lose count of the tacks when you’re on the handles. Someone said on the way in, it’s the meat and potatoes of sailing. You know on these short courses if you tack the guy out to the layline you can extend and round in the lead. And the gate’s keeping the racing closer downwind as well. You can’t get those big splits downwind. There’s a lot of talk about this being the final event for the ACC sloops, how do you feel about that? 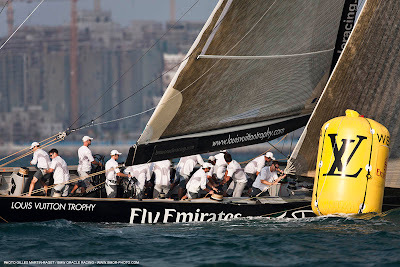 This is 10 years I’ve been sailing this class. We have some guys onboard who raced them in ’92. It’s good to be sailing with the guys from back then. 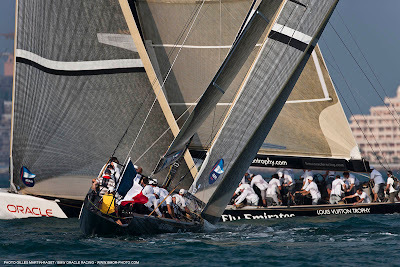 I don’t want to say the class needs to be put to bed, but after having sailed VO70s and the tri last time, a little more speed and action is good fun. Here the racing is close, but it’s been this way for 20 years. You and some of the other guys are sporting a mustache. What’s going on? Well, it’s Movember and this is something that came up in a training session before coming here. 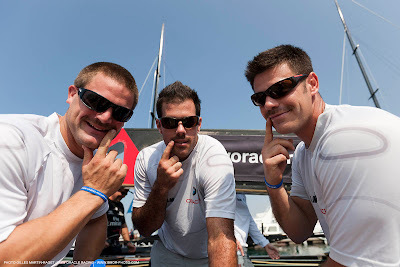 I think the fact that when I was growing up, I remember professional sailors rockin’ the mo’ quite strongly. There are a few guys who still run it today, but I won’t mention any names. There are a lot of other male-dominated sports like rugby and ice hockey that do this. To have this event in the same month is a great way to support research for prostate cancer and get it out into the mainstream media. Hair raisers: Simeon Tienpont, Shannon Falcone and Gilo Nobili sport their 'staches. 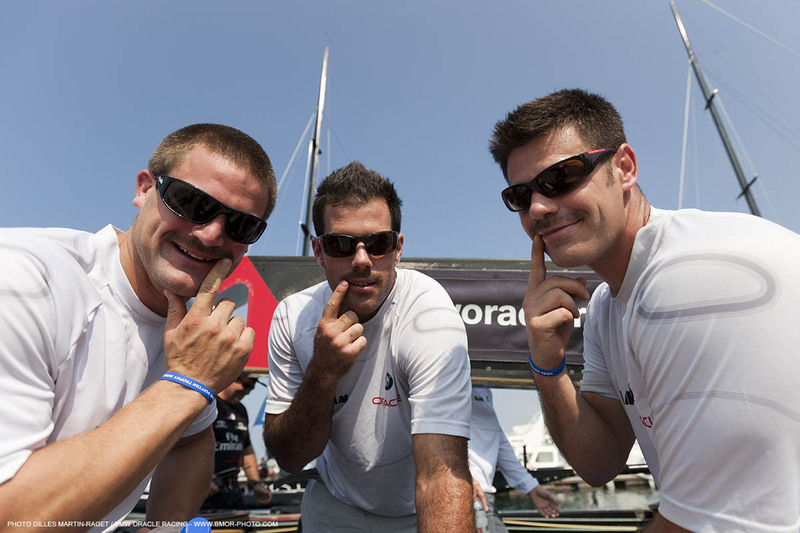 Murray Jones (left) gets some tips from John Koskecki (right) while James Spithill looks on. The All4One crew watches BMW ORACLE Racing cross on starboard tack. 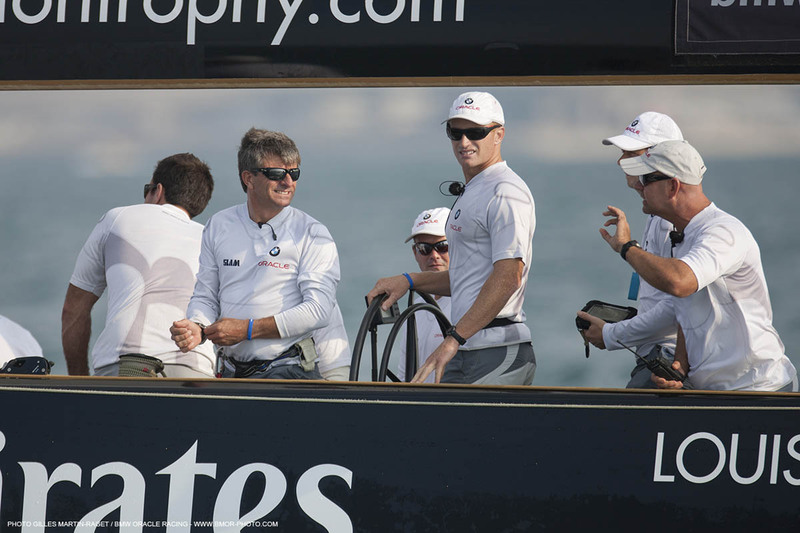 BMW ORACLE Racing rounds a windward mark. The sun sets on a successful day of racing.